Over the past few months, the Wii seems to have been flooded with ports of casual PC games; the same kinds of games that you can play limited versions of on sites like Playfirst or Pogo. 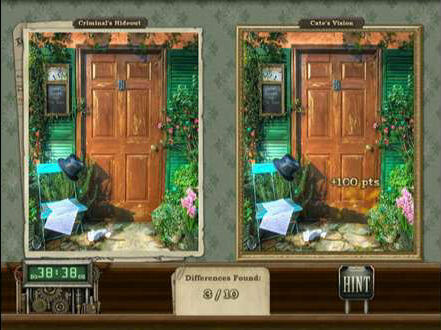 And while Bejeweled clones and other similar puzzlers seem to be leading the way in this PC to Wii transition, the eye-spy genre hasn't been forgotten, with Cate West: The Vanishing Files being the latest in said line to be released. Cate West: The Vanishing Files follows author-turned-psychic Cate West as she struggles to solve the mystery of her father's murder years before and (after pairing up with a team of local detectives) catch a new villain responsible for a line of arsons, thefts, and assaults in the city. What starts simply as a string of seemingly unrelated crimes quickly turns into a cat and mouse game between Cate, her detective associates, and an assailant known solely as "M," that spirals into a conspiracy with a religious theme (specifically the tale of the Three Wise Men), with the conspiracy having an unknown connection to her father's murder. The Vanishing Files is split into 15 cases, with each case being divided into multiple sections. The first has Cate finding clues throughout the city. Each location Cate visits has at least ten clues hidden within its incredibly cluttered frame, and is comprised of a blurry stationary picture filled with random objects from every walk of life. Using the Wii-mote, players investigate their environment by clicking on objects that match those on a "to-do" list located on the left side of the screen. Objects like dragonflies, footballs, and handcuffs come in one form that is easily spotted within the landscape, but others like pitchers, kings or spades must be thought of more carefully, as pitcher in this case may apply to a vessel used for holding liquid or to a baseball player, kings may be represented by the word being spelled out, a playing card, or a member of royalty, and spades being either a playing card or a garden tool, and so on. As one might expect, the hidden locations of each object range from obvious to pull-your-hair-out "where is the darn thing?!" difficult, made even more challenging by the fact that the game's graphics leave a lot to be desired in terms of detail. A purposeful design choice gives most locations a particular color as a theme, and then requires that you find objects of the same color (like a lobster or a heart hidden on a red fire truck, or leeks and asparagus being hidden in the grass, as examples). That being the case, the game definitely isn't a cake walk, but the challenge comes more in the form of undo frustration than anything resembling strategy. This is especially true when considering the fact that most next-gen titles are now developed with large, HD television screens in mind, which unfortunately greatly limits the game's potential audience. While of course playing on a larger TV makes the game easier, regardless of your television's age and style, it is my humble opinion that those who would play on a 25 inch or smaller screen should avoid the game altogether, as finding anything among the cluttered environments will likely be nigh impossible. At is stands, I played on a 27 inch version and still had to sit less than a foot from the screen, all the while struggling to get my Wii sensor bar to pick up on my pointer's movements. One thing that does decrease the challenge over time is the fact that there are a limited number of environments available to explore in the first place, so numerous cases will use the same set of locations. While the objects you are asked to find does change in each case, by the time you enter the same location for the second or third time, you will likely already know where certain objects are from your original time spent there. For those who are still stuck, hints are available which highlight a circular portion of the picture; however, they don't tell you which item from the list you will be able to find there, so using them may not be worth the penalty you receive on your score (you earn points for every item you find). The most useful tool however is Cate's magnifying glass, a mechanic that is normally either overlooked or entirely flawed in other eye-spy titles. 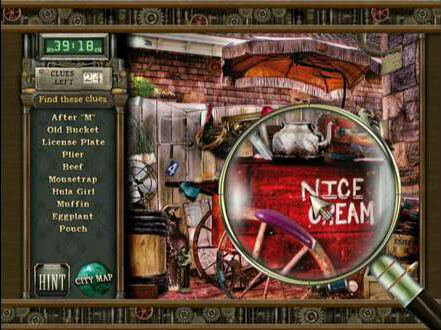 In this case, the magnifying glass blows up a circular portion of the screen at least three times, making the finding of each item a bit easier overall. 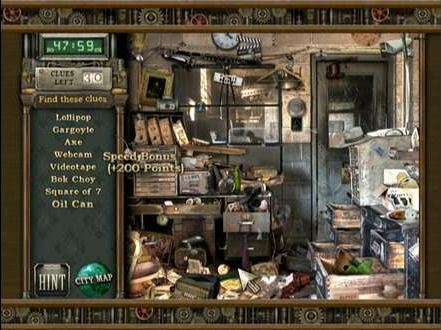 With 15 cases in all, and each case lasting around thirty minutes (or much more depending on how heavily you utilize hints or your own luck in finding objects), the game is by no means short, but also lacks a lot in terms of variety. 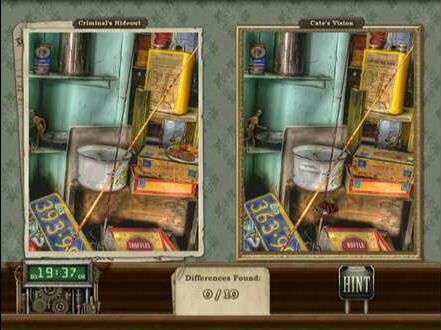 Even though there are five technically different investigation techniques that Cate utilizes in each case, four of those revolve around either finding lost objects in horrendously disorganized locations, or looking at two pictures of the same location and finding the differences between them. The only standout section comes when determining who is responsible for the crime, by looking at a lineup of suspects and combining Cate's psychic powers and your own deductive reasoning to eliminate all but the true culprit. Aside from the terrible voice acting that accompanies random sections of the story's mostly text-based dialogue, this is where one of the game's largest flaws comes into play. 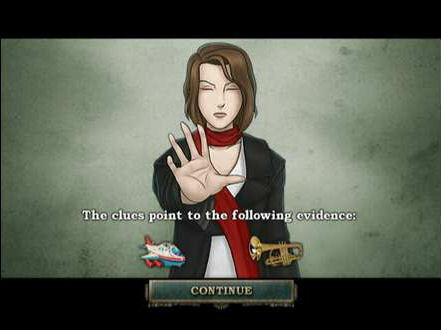 As Cate examines the clues found in the first part of each investigation, she eventually decides upon the ultimate pieces of evidence that must be found in order to solve the case. While this sounds good in theory, the mechanic is lackluster at best, and has Cate pulling objects seemingly out of thin air for you to find, ruining any sort of continuity in each case. For instance, how Cate can look at a pile of bolts, rubber duckies, flowers, hula girls, rings, and piles of lost mail and somehow decide that we should next go looking for a toy rocket and set of Christmas solider nutcrackers is head-scratching to say the least. Likewise, when you are told the crime scene is an old church or museum, why am I looking for the aforementioned evidence in the middle of a forest? 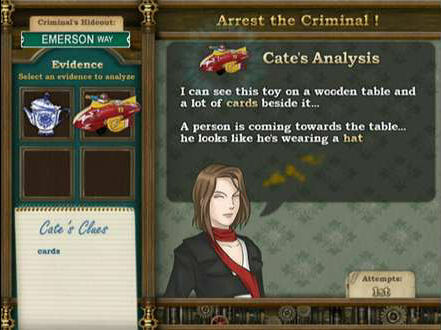 Nonetheless, after you find these vital pieces of evidence (in the same fashion as you found the case's original clues) Cate inspects each piece, and a vision is sparked in her mind that gives you clues as to the perpetrator's appearance, hobbies, careers, etc. She may say that she sees a lot of water or rocks around a person, and you would then determine who the culprit is based on if their short description mentions anything even remotely related to water or rocks. In this particular example, the criminal may be someone who enjoys sailing or fishing, or is a Geologist or hiking enthusiast. In most cases, there will be one or two suspects that fit all but one of the descriptors leaving you to find the sole person who fits them all, but in a few random instances, you'll be able to make a case for multiple suspects being the culprit and will end up in a guessing game over who to choose. 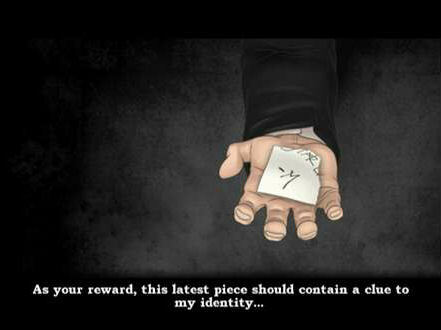 Luckily, your score is the only thing that is affected should you make a mistake, so you are free to ignore the clues altogether if you simply wish to randomly click on suspects until you get it right. All of that being said, thirty bucks is an unquestionably large price to pay for a game that you can really only appreciate the first time through. 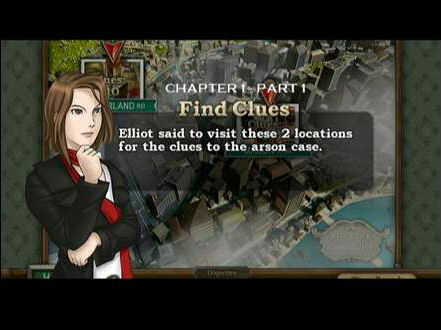 And while it is possible to play a new game after you solve every case, I can't imagine why anyone would want to do so, since the locations, clues, suspects, etc. all remain the same. 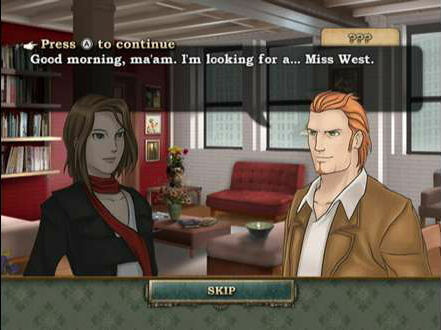 Even though the game tries to add new depth to the eye-spy genre, it still fails to escape the repetition so often associated with its peers, and in the end becomes a bit of an acquired taste, only able to be truly appreciated by those diehard fans of the genre who don't mind going cross-eyed by sitting a foot away from the screen.